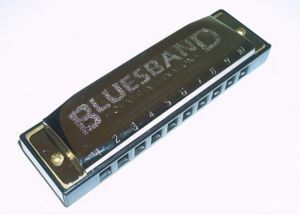 The harmonica (frequently known as the mouth organ) is a musical instrument consisting of a casing in which a series of small reeds is held in place in channels leading to holes in the casing’s side. The instrument is moved from side to side between the lips whilst the player exhales or inhales, producing a very distinctive sound. The invention of the instrument is credited to C. F.L. Buschmann (1805-1864) in 1821. There are two main types: the diatonic, which is tuned to a particular key - and the chromatic the tuning of which can be altered. Its portability and plaintive sound gave it almost immediate popularity in popular and folk circles, where it can still be found ( e.g. Bob Dylan.) In America in the early 20th century it assumed great importance in traditional blues music. The instrument bridged the gap to classical music - and even gained some measure of respectability - with its greatest exponent, the expatriate American, Larry Adler, for whom various serious composers wrote. Many of these compositions are on recordings available today. Hohner, the most well-known harmonica manufacturer.